Trailhead and parking area are on Pinkham B Road, in Randolph, NH. Pinkham B Road leaves the south side of Rt. 2 4.5 miles west of Rt. 16. The parking area is 0.2 miles down the road. The lower part of the Howker Ridge Trail, a route to Mt. Madison, follows the wild and scenic Bumpus Brook. A hike of one mile along this path rewards you with sights of many cascades, a mossy gorge, and the tumbling 30-foot Hitchcock Falls. From the parking area, walk to the trail signs and follow the trail across the Presidential Range Rail Trail, a gravel bike path. Bear left onto Howker Ridge Trail as Randolph Path goes right. The trail begins flat, soon passing through some swampy areas on bog bridges. After about 0.4 miles of easy walking, it reaches Bumpus Brook and goes by a ledgy cascade and pool. The first officially named waterfall you will encounter is Stairs Falls. 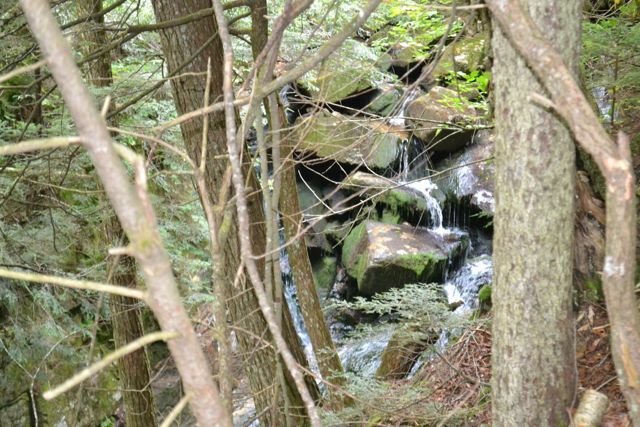 This waterfall is a short rocky plunge located where a tributary joins Bumpus Brook. You will notice that steps appear to be carved into the right side of the rock. Stairs Falls can be completely dry in low water. Next is Devil's Kitchen, a mossy gorge with high rock walls. Just beyond this gorge is Coosauk Fall. The trail is high above the stream at this point, so it can be hard to even see this unimpressive waterfall. Sylvan Way turns right across from this waterfall, and a short distance ahead, Kelton Trail turns right as well. The Howker Ridge Trail becomes steeper and climbs to the main attraction, Hitchcock Fall. This waterfall is a series of drops through a mossy, boulder-filled stream.